BERLIN, August 31, 2017 - HARMAN International, a wholly-owned subsidiary of Samsung Electronics Co., Ltd. focused on connected technologies for automotive, consumer and enterprise markets, will be at IFA, the world’s leading trade show for consumer electronics, presenting its vision of making life more connected, entertaining, personalized and productive through innovative, high-quality products and experiences. HARMAN’s announcements at IFA 2017 will combine the power of AI, smart wireless features, contemporary design, unmatched innovation, and sound quality to deliver a premium listening experience for all consumers. At the top of the list of voice-activated innovations that HARMAN will reveal at IFA 2017 is the Harman Kardon Allure. The first and only high-end speaker in the market with Amazon Alexa, it combines far-field voice recognition technology with refined 360-degree Harman Kardon signature sound and the sleek design for which Harman Kardon products are known. HARMAN is also announcing the integration of Google Assistant in the all-new JBL Link series of portable and home audio systems. These product families, along with the already announced Harman Kardon Invoke™ with Cortana from Microsoft, will complete HARMAN’s voice assistant speaker lineup for the upcoming season, delivering on HARMAN’s commitment to bring an amazing audio experience to the leading voice assistant eco-systems. 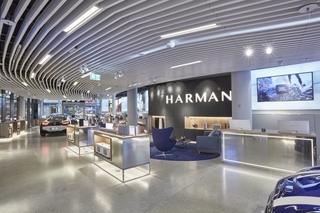 HARMAN sees voice control and smart assistant services as a cornerstone of a seamless, intuitive connected lifestyle and key component for smart products integrated into the IoT, and is committed to delivering voice-enabled Personal Digital Assistants and audio solutions for every platform, eco-system, and consumer need. To accompany these innovations, HARMAN has developed the all-new far field voice input technology,Sonique, a powerful and sophisticated microphone technology. In addition to its latest voice-enabled products and features, HARMAN is unveiling a wide array of other breakthrough innovations and audio solutions at IFA 2017. These include the all-new JBL BAR series of high-performance sound bars available in four models, as well as the JBL Boombox portable Bluetooth speaker. HARMAN will also announce several new headphones, such as the JBL E65BTNC over ear, wireless, active noise-cancelling headphone, the JBL Free wireless in-ear headphone, the JBL Reflect Fit behind-the-neck, in-ear sport headphone, and JBL Jr, JBL’s first line of kids’ headphones. HARMAN’s innovation leadership has been recognized on multiple occasions over the past 12 months, with 42 awards for 36 unique products, including 13 Red Dot Product Design wins, 3 Red Dot Product Communication wins, 8 iF Design wins, 8 CES Innovation wins, 8 Red Star wins. Most recently, the European Imaging and Sound Association (EISA) awarded the JBL Boombox in the European Mobile Speaker 2017-2018 category and the JBL Everest Elite 750NC in the European Mobile Headphones category. These 42 new awards join more than 250 awards won by HARMAN brands globally over the past five years for over 150 unique products, further cementing HARMAN’s status as the #1 audio award winner.